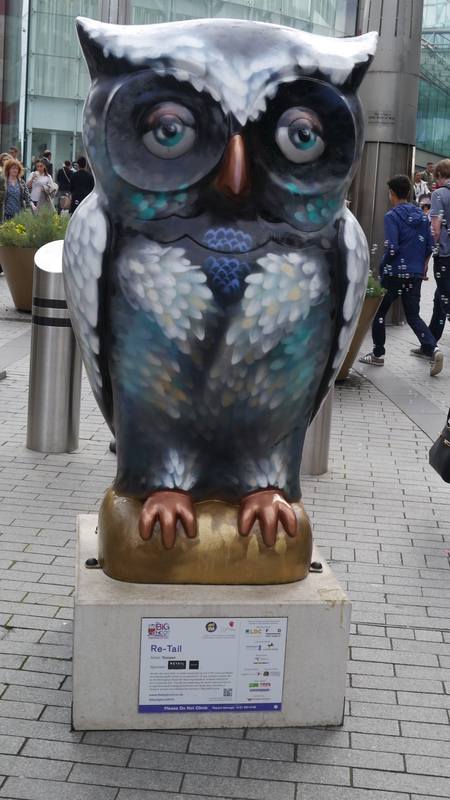 On September the 18th, I was racing around Birmingham City Centre searching for the fibreglass owls that make up The Big Hoot trail. One I found was number 89: G’owl’d by Temper. Temper, aka Arron Bird, is a successful and talented graffiti artist. After picking up a spray can at the age of 10, the Birmingham-based artist hasn’t looked back. Growing up in Wolverhampton’s Eastside, Temper was involved in the emergence of graffiti just as the hip-hop culture that accompanied it was making its way from the US to UK shores. Temper has developed a unique style of graffiti and conceptual art, which allows him to work in illustrative and free-hand ‘traditional’ graffiti, as well as exquisite figurative work reminiscent of the Old Masters. In 2001 Temper was commissioned by global brand Coca-Cola to create the artwork for their drinks brand Sprite; resulting in art by Temper appearing on over 100 million cans and bottles around Europe in what was the biggest graffiti advertising campaign ever seen. Evolving from the hip-hop and graffiti art culture which predominated his formative years, he continues to take inspiration from street art, popular culture, comic book art and music. Most importantly, he is inspired by his own experiences, ups and downs; his own journey continues to inform his art and ideas. 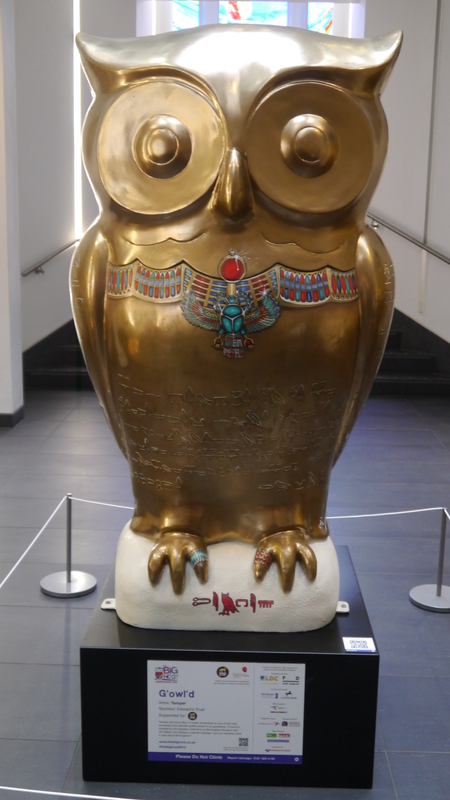 On September the 19th, I was rolling around Birmingham City Centre searching for the fibreglass owls that make up The Big Hoot trail. One I found was number 31: Re-Tail by Temper. On September the 14th, I was travelling around South Birmingham searching for the fibreglass owls that make up The Big Hoot trail. One I found was number 82: Blodeuwedd by Guy McKinley. Guy McKinley is an illustrator, concept artist, painter from Liverpool who has been involved in lots of diverse projects, relying on his strong character work. He initially began (and continues) producing hand drawn and digital work used in editorials, pre-production concepts, character design and more commercial images for promotional and advertising campaigns. More recently, he has also been taking part in live exhibitions and gallery shows with more personal paintings and illustrative work. His work is featured in The Street Art Sketchbook by Tristan Manco. He has exhibited his work all over the UK, Europe, the USA and has been commissioned to create work for clients including Disney, Carhartt, Adidas, New Balance, Diesel, Sprite (Coca-Cola), National Express, Becks, BBC and Walker Books.